June 11, 2016 | -by: Kevin George. Customer feedback method in emails is nonetheless one of the most tested and effective methods to understand if your business is succeeding in meeting out the expectations of the target market. Besides involving direct communication with customers, it is still one of the best ways to know why people are doing what they are doing and for reviewing your marketing strategies. In fact, customer feedback combined with analytics helps in bringing forth a much clearer picture of the customer behavior and expectations. What is their feedback on product/service – quality, price, etc. What was their motivation for choosing the store – price, discount, free shipping, etc. What was the method used to find your brand – search engine, customer referral, social media, other online ads, etc. How was their overall service experience – website navigation, delivery, customer service experience, etc. Customer feedback received through emails can help you set things right – right prices, an upgraded product list, an efficient customer service, etc. In a nutshell, feedback directs your decision-making and influences the product/service roadmap. What makes email surveys even more special is that you can seek information from the customer on the entire shopping experience, from Search to Shipment. There are several tools that help to create professional surveys. Many services like Survey Monkey can create them for you. Another ‘easy to use’ way is to create Google forms which are free and can be used to create unlimited surveys. 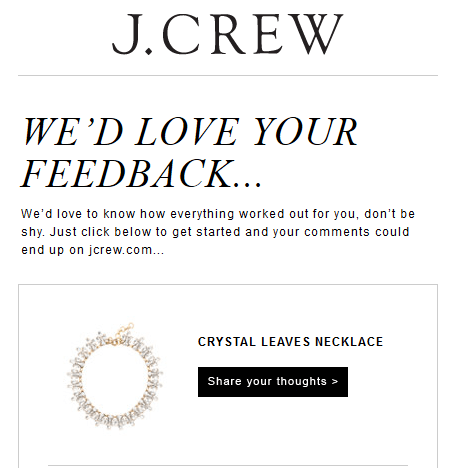 A feedback/survey gives your customer an opportunity to share exactly what they like or dislike about a service/product. The information can be helpful in improving operations and customer satisfaction. If your customer is happy, it is obvious that you are less likely to lose them to a competitor. Customer feedback helps to retain customers, as you act on the suggestions identified in feedback surveys. If an issue is resolved in customer’s favor, there is a 70% chance of return. A negative review online is a bitter pill to swallow, especially for the service industry. If you provide the customers direct feedback options, it will reduce the amount of negative feedback on review websites, which can hurt you financially. The direct feedback gives you a chance to solve your customers’ issues, thus helping to retain them. If you have run a feedback program for a year or more, it will be possible for you to compare financials to determine whether enhanced customer experience results in better business outcome or not. More often than not, it does. Customer feedback is important if you wish to develop your business, products and services in line with the customers’ needs. And the easiest way to encourage customers to respond to your feedback emails is to keep the process as simple as possible. To maximize the effectiveness of this channel of communication, you need to follow these 8 divine rules jotted down by the Monks from the Monastery. A survey should always be short because if a customer gets bored, they are going to stop filling it out. A survey that will take not more than 5 mins increases the chances of customers making it to the end. J. Crew hits the nail on the head. You want to send out feedback forms to those who have made a recent purchase or have returned a product or not purchased from you in a while. Segmenting your customers is important here. Target the segmented customers with an email and feedback form that’s relevant to them- this is very important. Sending the right kind of questions to the right customers helps to increase customer feedback. A personal touch can work in your favor in many ways. To begin with, use name personalization- start with a ‘Dear John’, or ‘Hey Jenny’; this makes the customer feel special, it makes them feel you value their opinion. Emails sent from people ie. from a personal address work better than a brand email address. Personal introduction will be like a cherry on the cake. Keep the feedback/survey form simple. The format may change depending on the kind of feedback you want but the catch is- it should be simple. The best way to keep complications at bay is to create a survey with an easy yes/no selection or score rating to measure effectiveness. If this isn’t sufficient, you can always add a comment box. 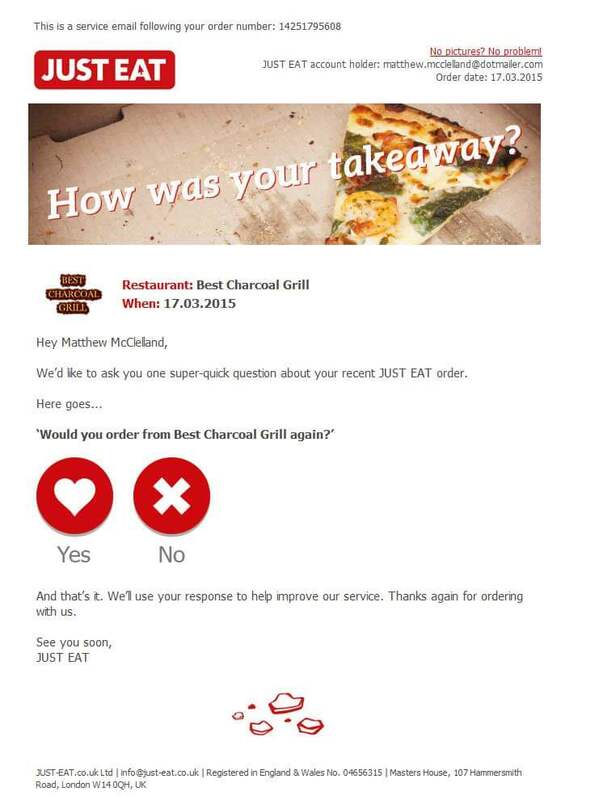 JUSTEAT keeps it personal and simple – very nice. Incentives can lure your customer to take a survey. A discount coupon, a freebie or entry into a lucky draw will work better than a flat email, always. In fact, some recipients might complete the survey just because of the incentive you are offering. 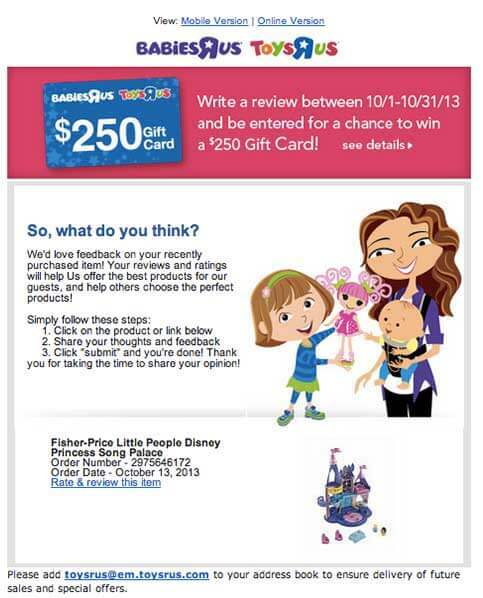 ToysRus lures its customers to write a review between a specific period to get a chance to win a gift card. A cute image adds some more flavor to the incentive. You might have created the best customer survey but are you sure your customer will even open your mail? If you don’t want your efforts to go in vain, make sure you jot down a short, to-the-point and really stunning subject line. A well-designed, eye-catchy email will help in increasing open rates- you can include not just your products but some accolades as well. Images too can work wonders in creating an attractive email; don’t mind including one. When you launch a newbie– At the time when you launch a new product or design, you can ask your customers to opine. When you acquire new contacts– You can know your new subscribers better by sending a targeted survey to the new list. By doing so, you can find out their interests and their expectations from you. When open and click-through rates take a nose dive– A survey can aid in finding out the reasons behind a decrease in your open rates as well as click-through rates.